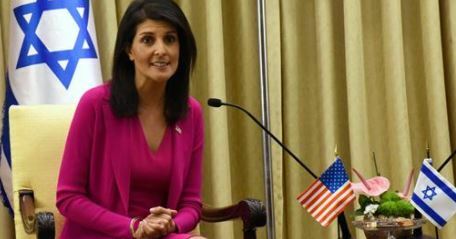 Haley’s behavior is hyperbolic, arrogant, and extremely dangerous to the reputation of the U. S. but it seems as if she acts according to the slogan: Freely you live, if you haven’t a reputation to lose. But under the borderline Trump administration even a „un-American“ behavior, it benefits the Zionist regime, seems acceptable. So far, all so-called chemical weapons attacks by the al-Asad government were false flag attacks carried out either by al-Nusra, ISIS or al-Qaida terrorist organizations or by the „White Helmets“ themselves that are a so-called a terrorist affiliate organization, disguised as paramedics, to draw the U. S. directly into the Syrian conflict. With which „civilized world“ should Russia take sides? Does Haley mean the U. S. or the Zionist occupation regime? The first one has slaughtered millions of people in endless wars, the later has been subjugated another people for over 50 years and destroyed its existence. This „civilized world“ and its values are for the garbage dump. Despite his twitter manticism, Trump was still a kind of common sense that can differentiate between the good for America in contrast to the good for Israel for the sake of the American people.